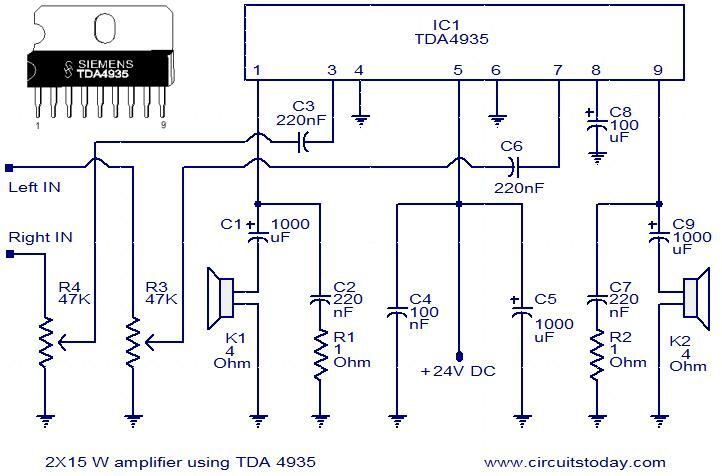 TDA4935 is bipolar stereo amplifier IC that can be wired as a 2X15W stereo amplifier or a 30W mono BTL amplifier. The IC also features built in circuitry for over load protection and over temperature shut down. Here the IC is wired in stereo mode in order to deliver 15W power on each speaker. The circuit does not require a dual power supply and it can be powered from anything between 8 to 24V.Here I am using 24V for getting maximum output power. The circuit can be powered from anything between 8 to24V. Use 20W, 4 Ohm speakers for K1 and K2. All electrolytic capacitors must be rated at least 25V. Hi Sayooj you dont require regulated supply. you can use a 18 volt 3 amps trasformer with 4nos 1N5404 as bridge rectifier with 10000uF as filter. pleze sugest regulated power suply circuit dagram for this amplfier. Hi Dev 220nF is 0.22uF ceramic disc cheap and freely available or 63volt polyester or any non polar capacitor. can u tell me the 220nf capacitor electrolytic or ceramic? Hi CJ mP3 will have both the channel outputs. a 3.5mm socket will provide common left and right signals. you connect left channel signal left etc. standard connecting cables are available can be used. Hi Binesh you can connect, ensure proper screening of your amplifier and use a low pass filter (just 1K ohms resistance with 470 PF- refer motional feed back amplifier)to avoid RF getting into your amp. can i connect my amplifier to my mobile phone headset signal as input? Hi Jakuv the following datasheet gives you the PCB layout etc. use it. I WANT A LAYOUT PCB FOR THIS CICRCUIT INCLUDING A POWER SUPPLY.. PLEASE HELP ME FOR MY FINAL PROJECT..
Hi Sicko With 20 volt DC the output will be 11watts into 4 ohms as per mfg datasheet, at an efficiency of 70%. Hence the power input required for the chip is around 16watts 16/20 is 800mA both channel put together 1.6Amps. with head room 20volt 2amp transformer is the best choice. Hi Rolly TDA2050 will be the ideal chip for your requirement. hi!i need 30 watts stereo amplifier can you help me! where is the input for the -ve terminal of voltage supply? Ow another question. what powersuply should i us. Im planning to use 20V. But how many Ampere should it be ( (15Wx2)/20V= 1.5A )or is it more? Heya i got 2 speakers of 15W each and i love to connect them to my laptop somehow. Now i was woundering if this amp will allow me to do so. sure you can try it. But, be careful since you are playing with your costly laptop. other sound sources like a radio or MP3 player before connecting to the laptop. We have a need to control voltage for audio input to a car audio amplifier. But with high power head units (9 volts â€“ can deliver 50 watts per channel), the amp can handle this if the high input switch is activated. We do not want to activate this but leave switch in low power setting â€“ but use a voltage regulator so input voltage is always low and same for all. Ie. We can use MP3 or head unit power amp without switching and adjusting gain control. Hope I make sense and would really appreciate any comments. please send walk throug metal detection circuit .